And suddenly, just like that, the business end really starts. Like it or not, Liverpool fans would do well to get behind the new manager Brendan Rodgers, and any other senior staff on the way. Some may have complained that it took too long to appoint him. Yet had FSG been quicker, the conspiracy theorists would have complained about alleged behind-the-scenes pre-emptive discussions between FSG and their new appointment while Kenny was still in charge. Many would have been distressed at how disrespectful that was – even though that was likely done to Houllier (and probably to Hodgson). Of course there will be those who differ in opinion – and some will treat Rodgers with the same indifference afforded to Hodgson, and others will show him affection in hope of the promise of a big future. Either way, his success depends on a few things, not least of which Liverpool’s existing squad, any transfers in / out, and the support FSG give him in all respects. I can’t speak for the third item on that list. Even though FSG have been in charge for over 18 months, it feels like a nervous courtship all over again. But all the right messages seem to have been communicated in the process of announcing Rodgers as manager, so I assume he’s got the full (or close to it) support of the men from Boston. Tactical options with Rodgers, of course, are interesting. Observations of Swansea suggest a very quick pressing game, heavy emphasis on transitions, keeping the ball and making opponents chase you, and potentially more penetrative, possibly even likely to create better goalscoring chances…? Some of his statements already imply that he sees opportunities (necessities, more likely!) to improve the squad in certain positions. Swansea’s brand of football was a joy to watch the past season, and Rodgers’ chosen tactics could bring out the best in players like Reina, Agger, Lucas, Johnson, Enrique, Suarez, based on positional play. It will take time for the others in the squad to adopt the style successfully, although I would imagine the more “direct” style players may be good for tactical variation. However, there are some key issues that Rodgers will have to address, as far as the squad’s composition, balance and application is concerned. For starters, I really would like to see Rodgers rotating the squad to create options and experience. The League Cup and Europa League ideally need to be used as grounding points this season to give squad players more game time and experience. Too many players last season got too little consistent game time, and that affects their impact when being forced into the squad. We also need to be realistic about several aspects of the squad strategy for next season. It’s doubtful after the frivolous spending of last season that FSG will allow similar spending levels for this summer. Liverpool’s wage bill was the 4th highest in the league last season, meaning FSG will want to trim it down where it makes sense. And any Liverpool fan who expects the summer to pass without incident as far as one of our star players leaving may be too hopeful. I’m being pessimistic, but I think we could experience at least one high profile departure – with Reina, Agger, Skrtel and Suarez being the players most at risk. It’s very rare that a team needs to use their 3rd and 4th choice keeper in a squad. One hopes the incidents leading up to the FA Cup semi-final against Everton don’t repeat themselves, but ultimately they highlighted some issues. Brad Jones’ attitude is great, but I really think he needs more time between the sticks in match situations – and hence would be my favourite to loan out, with option of a recall in emergencies. Reina has been poor – his shot stopping seems to have become non-existent, and instead of buying us undeserved points (like he did so often in 2010-11), he cost us a few times this past season. He needs competition desperately; there must be consequences for poor performance. Doni looks a useful stopper, and it would be great to see him play more often. Rodgers’ chosen tactical approach ironically would leverage Reina’s bravery on the ball – and Reina is capable of the odd assist every now and then – so one hopes Pepe sees this as an opportunity. No transfers expected here – although if Reina insisted on leaving, then it’s an option to sell him but for enough funds to bring in a younger replacement of the same class. This is a key position for Liverpool – particularly since much of the build-up play starts out wide from the back. The good news is, Rodgers’ tactical approach may take advantage of some available talent. At right back, we're spoilt. Flanagan had some poor games, but that's probably due to a lack of confidence that comes from a lack of a run in the team. Martin Kelly’s potential is still untapped, and he looks an outstanding player for the future – so more rotation would be great. Glen Johnson is looking world-class – he just needs to stay fit! Enrique was a good signing, but slumped in form, and didn’t get dropped. That’s not a good sign of squad depth to create rotation, so left back is a key position to strengthen in the summer. Although, as an alternative, Kelly (at RB) and Glen Johnson (at LB) combination has worked well on occasion. Either way, Enrique needs competition. Ideally someone who can cross well, especially from deep (one of Enrique’s weaknesses) and pacey enough to handle super-fast counter attacks (as opposed to how Enrique handled Ramires in the FA Cup final). For me, Robinson & Flanagan must be used in the cup competitions, or the Europa League - we must take advantage of these fixtures to really give the squad players a good go. Our first choice central defence pair is comparable to the best in the league - Kompany/Lescott, Terry/Ivanovic, Vidic/Ferdinand, Vermaelen/Koscielny, etc. But it's clear that Agger has a massive influence over its effectiveness – Skrtel tends to play worse when he’s compensating for the misgivings of his defensive partner. I also don't think Coates should be loaned out. Alternatively, Liverpool need to bring in a solid and experienced centre back to rotate Skrtel & Agger, lest they too become complacent. Agger is the key; not only is he an outstanding defender, but he leads by example as well, and his presence attacking corners tends to get us goals. Carragher has been a fantastic servant to the club, and I don’t think anyone disputes his commitment. But ultimately, some of his performances haven’t been great, and it may mean time to see him take up that coaching role we all suspect he would like one day. Of course, as mentioned before, all this assumes our 1st choice partnership remains intact. There’s a shortage of proven centre backs out there, and Skrtel in particular will not lack potential suitors. If he does get sold, let’s hope it’s for the 8 figure sum we expect, and an equally outstanding defender gets purchased in our direction, one very comfortable on the ball as Agger often illustrates. This position is a big issue. Against the midfields of Newcastle, Spurs, Arsenal (as examples), Liverpool lack the quality to take control of games, placing more reliance on the wide play, making them predictable. If there is one thing that excites me about Rodgers, he should be able to teach the players here how to be more penetrative through the middle, which is something Liverpool lacked in many matches against more capable central midfield opposition. Rodgers’ immediate problem is the number of players in the squad who play in the middle – Gerrard, Shelvey, Henderson, Adam, Spearing, Lucas (as well as Cole and Aquilani when back from loan). You'd think with so many, there was competition for spaces, but as an example, Hendo's extensive run in the team probably resulted from a lack of meaningful competition in most cases. It also means that unless something unusual happens, we’re unlikely to see incoming transfers in this position. The other irony is that only two of them – Lucas and Spearing – play that pivotal defensive midfield position. Rodgers will do well to realise that Lucas is unlikely to be the same (at least immediately) after such a serious injury. Liverpool cannot afford to force him to play every game like they were. While Spearing is a good squad player with a great attitude, a third defensive midfielder is definitely needed, especially given the passing responsibilities Rodgers may impose on a player in this position. It makes me hope rumours linking Liverpool to players like Seydou Keita are true. The rest of the central midfielders need to be rotated based on performance. I also would love to see more of Shelvey – his attacking instincts imply a great deal of talent. For me, Hendo played too much and seems too intimidated in big matches where the pressure is on. Adam is a challenge to manage, since he produced so many assists – but I’m a firm believer if you deliver that many corners without beating the first man, you deserve to be dropped. Adam is a squad player – nothing more. Were it up to me, Hendo, Shelvey and Spearing would form the basis of a trial midfield in League Cup and Europa League matches – that would give them experience, keep them match fit and more importantly, give them the responsibility to lift their game. Then of course come the two wildcards returning from loan - Joe Cole and Aquilani. I don’t believe Cole has much more to give, but I feel for Aquilani, who hasn’t really got the chance to prove his talent since being signed by Rafa as “Alonso’s replacement”. Given the wage bill, I think it’s likely that both will be sold, but if one does stay – I really hope the Italian gets his chance to come back into the team. 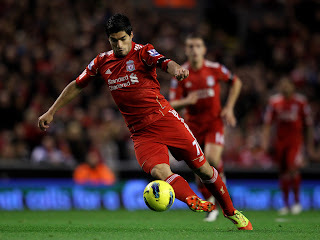 His technical skills could be great foil for players like Suarez to exploit, and would possibly be quite suited to Rodgers’ approach. It’s on the flanks that Liverpool’s squad begins to show imbalances, although, we should take into account that Rodgers may not have need of traditional wingers, since his tactics generally rely on width from the fullbacks, or “wide forwards”. Nonethless, assuming (on occasion) Liverpool need to apply a slightly more direct, counter-attacking style, the squad lacks the correct players. We only have one “true” winger. Maxi, Kuyt and Bellamy are all best employed as “wide forwards”, and with the exception of Bellamy, seem to lack the pace needed to run the wings like your traditional wings. Maxi and Kuyt are likely to leave in any case, and given age and wages, should be sold. I adore both players, especially Kuyt for his work-rate, but younger players are need with the technical skills matching that of a Suarez. Bellamy’s experience would be a great element of balance in the squad. It brings us back to Stewart Downing – enough has been said about him to bemoan his contribution (or lack thereof), so if Liverpool cut their losses and sold him at a cut price, that would be fine with me. I don’t see him settling into the Rodgers’ style of play in any case. I’d also love to see Sterling come into the team – and my suspicion is that depending on transfers, this could be likely. In fact, Rodgers’ tactics may define the transfer priorities to a wide forward on the right (Suarez would be my choice on the left) with similar levels of technical skill to penetrate defences. This for me would be the best way to really get the best out of most technically gifted player, who I had the privilege of seeing in the flesh in the infamous World Cup 2010 quarterfinal against Ghana here in South Africa. I remember noticing something distinct in that match. His movement off the ball, playing off Forlan was some of the best I’ve seen. Suarez thrives best playing off other players on the pitch who attract defenders and create space – his career alongside Huntelaar at Ajax is also proof enough. 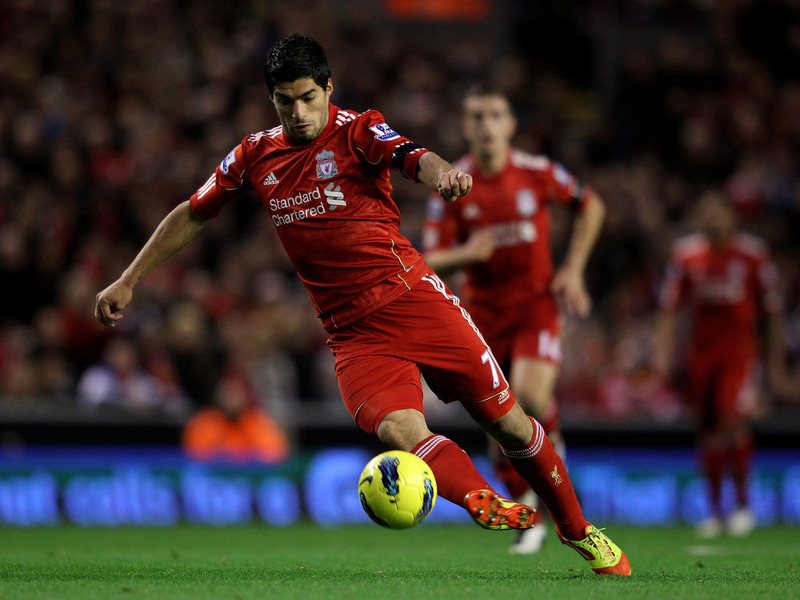 Suarez is also, another player at most risk of leaving. Rumours suggest Juventus, PSG and Real Madrid already amongst the admirers, and if Liverpool don’t bring in trophies, or Champions League football quickly, it may force the hand of our most talented player. That leaves the goalscoring department, which was much analysed over the past season, with the Opta faithful amongst us counting the woodwork, shots, corners and clear cut chances to death. Carroll may have ended the season well, but his shortcomings are exposed. He’s not a clinical finisher by any stretch. If we keep him, I see Andy as an expensive, but potentially useful squad player. He needs competition, and a more natural goalscorer to learn from. Question is, do you buy another big man? Or a mobile, pacy goal-poacher? There are arguments for both, though I prefer the latter, to offer tactical options and versatility. This would be a major transfer priority for me as well. It’s interesting, but the squad isn’t overtly lacking in talent or depth in most places. One gets the impression that a couple of shrewd, potent signings are all that will be needed to turn Liverpool’s fortunes quite impressively. Or the new boss could surprise us, and overhaul the squad completely. The question then beckons – who to bring in? The speculation suggest Brendan Rodgers will receive £30 million plus any fees from player sales, so assuming that he sells the likes of Downing, Maxi, Kuyt, Cole and possibly Aquilani, we should hopefully be looking at a transfer kitty of £50 million. The targets will vary, and the speculation will be rife with many players that been linked / interesting thus far. I won’t attempt to offer names – that would ruin the speculative fun of chasing various tweets on the subject. Besides, there’s someone else more primed than me to solve that problem. 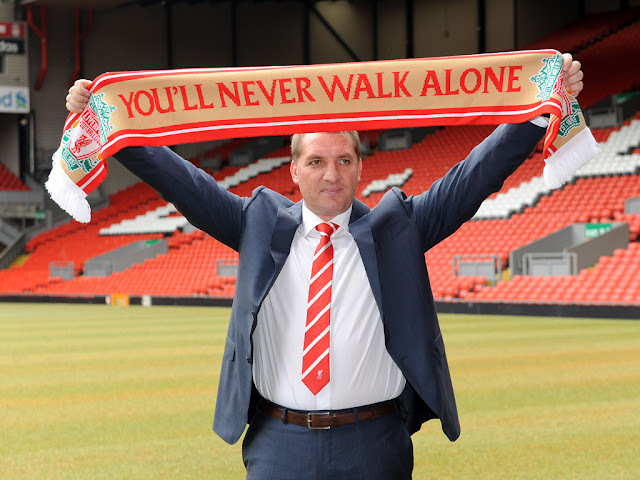 Mr Rodgers, welcome to Liverpool Football Club. No pressure.